At what point does the most ardent supporter of President Obama admit that his administration is out of its league? 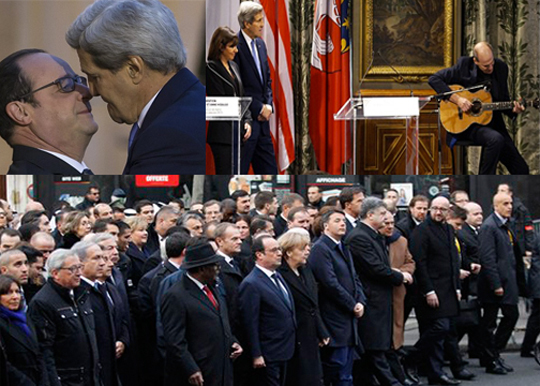 The U.S. was not able to send a single recognizable figure to meet with 40 world leaders as 3 million free-speech-supporting Frenchmen marched through the streets of Paris, but a week after the fact John Kerry can come strolling in — with James Taylor. Secretary of State John Kerry brought singer-songwriter James Taylor to help sooth tensions in France on Friday after last week’s terrorist attack against the Paris headquarters of satirical magazine Charlie Hebdo. Taylor performed a live rendition of “You’ve Got A Friend” as Kerry stood next to him. “Close your eyes and think of me and soon I will be there to brighten up even your darkest nights,” Taylor sang softly. The visit came after the White House admitted it made a mistake when it failed to send a high-profile US representative like Kerry to France’s massive anti-terror rally last Sunday. Where does one begin? Perhaps there are some bongo-playing Baby Boomers out there who think this was a good idea, but in in general it’s just embarrassing. Imagine you are a woman in her mid-thirties and the guy you’re seeing starts making mix-tapes like you’re both still teenagers every time you want to talk about something important — that’s the State Department under John Kerry. If James Taylor wasn’t available, would someone have asked Barbara Streisand to sing “No More Tears”? If she weren’t available, would someone ask Elvis Costello to sing “I Want You”? If John Kerry were a cellist with Yo-Yo Ma’s skills and he composed a personal tribute in memory of the victims of terrorism, then that would make sense; bringing in James Taylor to a diplomatic engagement is just weird. If you feel like someone is playing a joke of gargantuan proportions on you, then just know that you are not alone. LOL…what the hell right? It’s like not going to someone’s funeral and then calling everyone together again to have another one, where you are the center of attention. I wonder what they are saying about this in France? LOL…what the hell right? It’s like not going to someone’s funeral and then calling everyone together again to have another one, where you are the center of attention. That may be why Fearless Leader did not attend the original anti-terrorism rallies. With over three dozen world leaders there, he might have had to share the spotlight. Barry wants to be the bride at every wedding and the corpse at every funeral. I was trying to think of the right way to bring up President Obama’s speech in Berlin but then decided against it. During an American election he’ll travel to Germany so he can be treated like a rock star, but after a terrorist attack of global significance he couldn’t go for some reason (or at least send his own Secretary of State)? Interesting. The clip itself is hilarious on so many levels–James Taylor even mentions Martha’s Vineyard, where he and Kerry likely became pals. Haha! Ken, I totally forgot about this episode. Now I’m kicking myself for not remembering. I have no comment…just sad…sad…sad. Next up: Obama invites the Beastie Boys to the SOTU Address to lobby Congress, nation for new constitutional right to party. Little known fact: World War I started because Arch Duke Ferdinand started singing “Daisy, Daisy” over and over, badly, and the assassin couldn’t stand it anymore. Amazing but true.